You can resolve some mathematical shapes (area, volume, perimeter, sides or angles with parameters that you know. 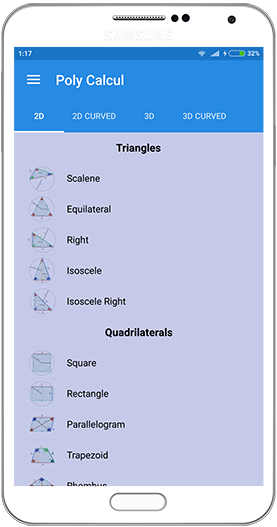 This application can also have an education way with the possibility to see clearly some mathematical shapes that perhaps you’ve never seen before. You have an access to resolve and see 47 shapes included triangles, quadrilaterals, polygons, circles, Archimedean solids, platonic solids, pyramids, prisms or sphere, etc. You can get the mobile app here ! Simple !